In this guide, we learn how to take screenshots or screen capture and save what you exactly see on the computer screen into an image file. You can edit the screenshot image using image editors like MS Paint. For those who need to take screenshots often, have a look at the list of free screen capture softwares towards the end of this article. For those who are not familiar with this term “screenshot”, imagine that you are playing a game and have just defeated the top level monster. You are elated and want to share this moment of glory with your friends. How do you take a photograph of your screen without having to use a camera or webcam? The answer lies in capturing it as a screenshot, saving the image file, editing it if you have to, and emailing it to your friends. Screenshots are also handy when you are reporting problems and error messages to software companies or internet service providers. This will help them to better understand the problem. Our readers had also referred us to their screen captures when raising queries relating to their template customization. As well, when submitting your blog to blog directories, you may be required to upload an image, which can be a screenshot of your site, to go with the listing. In the standard keyboards, there is a button key that reads “Print Screen”, “PrntScrn” or “PrtScn”. To capture a screenshot of the entire screen, press this key. To take a screenshot of the active window or program, press “Alt” together with this “Print Screen” key. If your computer is connected to a printer, the image would be printed onto paper. Since this image remains on your computer clipboard, it can also be transferred to an image editor program. To save the screenshot, after pressing the “Print Screen” key, open an image editor program. Users of Microsoft Windows can use Microsoft “Paint” found in Start Menu -> Accessories. Once the program is opened, go to Edit -> Paste. Your screenshot can now be edited. For example, if you want it smaller in size, press Ctrl+W and reduce the horizontal and vertical percentage values to a number smaller than 100%. You can add Text or change the colors. When you are satisfied with the new image, go to File -> Save As and choose a file format. If you plan to edit the image further, save it under the .bmp format (bit mapped format). This is an uncompressed format but because of that, the image file size can be very large. You can also save it in .jpg, .gif or .png compressed formats. If you are using the screenshot as an image in a Word document or slide presentation, paste it directly into the project by pressing Ctrl+V. Most word processor softwares have image editing tools which you can use to edit and resize the image. Should you want the screenshot in your blog, do all the editing and resizing using MS Paint or other image editor. Save the image into your computer and upload the picture onto your blog post through the Post Editor, or onto your template using the Add a Page Element function. If you need to capture screenshots regularly, consider using free third party image capture softwares to help you. Most of them are simple, easy-to-use programs that enable you to take screenshots of the entire screen or a part of the screen that you select, and saving them onto your drive. They have basic image editing tools which are adequate for many of us. I love this site. Thanks so much for the tips and tricks. 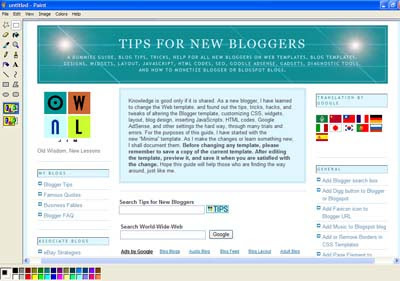 Blogging is new for me and I have found your site very informative and simplistic.